Some time ago I helped a customer who had an existing tourism site. We naturally assumed that targetting the geo-location and the word “tourism” would be suffient. So for example “tourism in cape town”. The first one focusses on tourism and seems to be a close match to their actual business… which falls under the category of tourism. 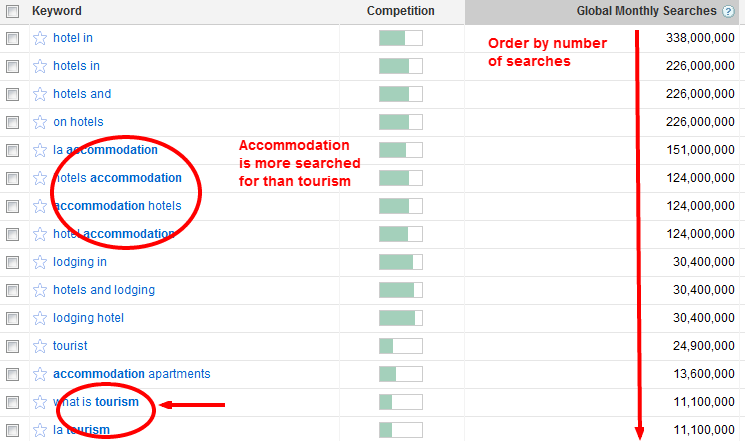 But in fact the second phrase using the word “accommodation” is by far the more popular search term – as you will see below in the screenshots. The key thing is to do research NOT on what YOU think people are searching for, but to use the Google AdWords Keyword External Tool to find out what they actually ARE searching for. I add in the geo-location in order to cut down on visitors that are unrelated. Let me illustrate: I once had a client who told me he was getting 15,000 daily visitors but no one was buying his health products. He was getting tons of visitors for the wrong reasons, because he had a reseller program on his site. Anyone could “make money from home” selling his health products. So people were visiting because of his work from home business, not because they wanted to buy his health products. Using these tips above, you have enough information to be able to target visitors who you were not reaching before. If you have the time to do all of this, that’s great! If you don’t have the time but you are looking to work with a partner to do this kind of work for you, please contact me.